We practiced contrasting traditional horticultural practices in the second half of December, one seasonal and the other not so. Following a mild wet autumn we recorded an overnight (17th December) high of 15.6°C, slightly lower during the day at 13°C. This prolonged weather pattern resulted in steady growth of the lawns resulting in patches of long unkempt grass in need of a topping cut. The difficulty being the saturated state of the soil had prevented access with mowing equipment. With a break in rain falling and the sun shining we took the opportunity to mow the front lawns. Even gaining, for Paul, filmed mowing the Palm House lawns, national news coverage. 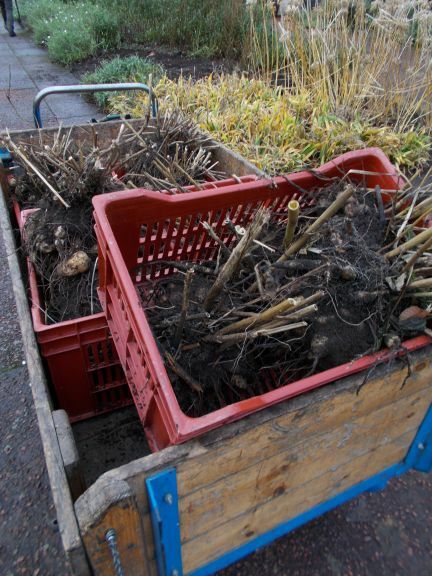 In contrast a ground frost overnight on the 13th December blackened off the Dahlia foliage, traditionally the time to then lift the tubers, for dry overwinter storage. 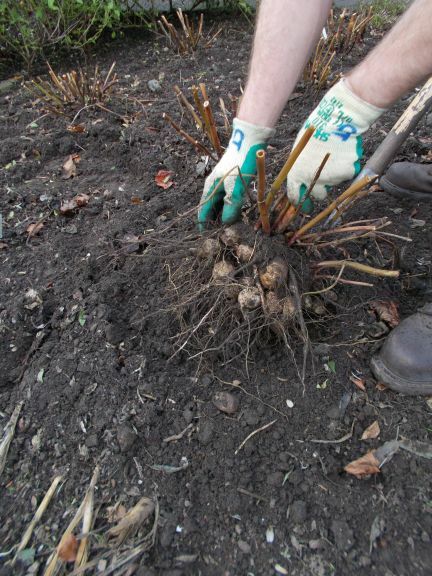 Use a fork, away from the root zone to avoid damaging the rounded tubers on prising from the ground. As they are pulled from the ground give a good shake to loosen off the bulk of the soil. Collect together and store upside down in a cool environment to allow to dry out.